As of January 1, 2016, all European banks will be subject to "Bail Ins". What is a Bail In? A Bail In is a procedure whereby a failed or failing bank can convert some of your bank deposits into the stock of the failing bank. In other words, money in your bank account can be taken by the bank and converted so that you would now own stock in what had been a failing bank. You see, once you deposit money in a bank it is no longer yours. It belongs to the bank. You are what is called an "unsecured creditor" of the bank. The bank owes you the money as if you had laid the carpet in the bank lobby. Well, "Those Europeans..." you say. Right. Except the FDIC (along with the Bank of England) issued a paper on December 10, 2012 on how Bail In procedures will be implemented in the U.S. and in England. This isn't "conspiracy theory" ramblings; this is real. As I said, it has started in Europe and the FDIC has issued a paper on how it will be implemented here. And it is why I have written about this and have now published the information in my new book, The Coming Financial Crisis: A Look Behind the Wizard's Curtain. I have expanded the book I wrote called Crisis by Design to encompass this new banking scheme and what you can and should do about it. I am writing this, of course, to promote the sale of the book. But also very much to alert people about this strategy by international bankers to protect large banks by confiscating the accounts by their very own depositors. Sound impossible? 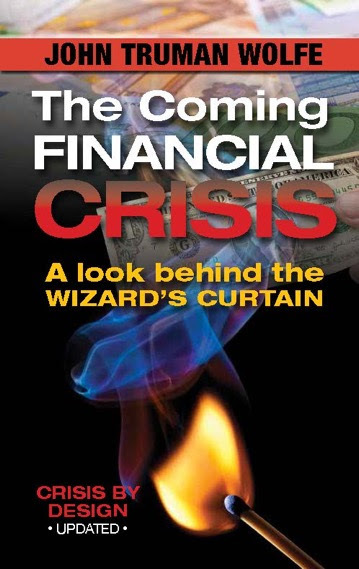 Buy and read the Coming Financial Crisis: A Look Behind the Wizard's Curtain by clicking the link below. Educate yourself so that you do not become the effect of these gluttonous financial institution's and their insatiable greed. Copyright © 2016 Concentric Order, All rights reserved. You subscribed to my list or bought one of my books from me to find out more about my writings.